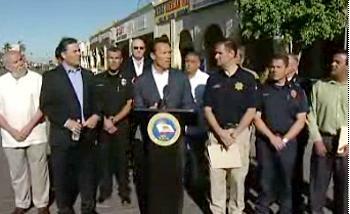 CALEXICO, California, April 8, 2010 (ENS) – After touring the damage in the border city of Calexico caused by the 7.2 earthquake in Baja California on Easter Sunday, Governor Arnold Schwarzenegger signed an executive order today providing further assistance to Imperial County. The earthquake was followed by more than 350 aftershocks. Although there was no loss of life on the U.S. side of the border, the governor proclaimed a state of emergency in Imperial County on Monday after the quake disrupted telephone communications, damaged many buildings in Calexico and caused millions of dollars in damage to the city’s water treatment and storage facilities. He pledged to speed up the process of inspecting buildings by providing additional inspectors so businesses can reopen with confidence that their buildings are safe for the public to enter, even if there is another earthquake. Today’s executive order recognizes that the earthquake caused the loss of personal and business records just when many people need access to their records to comply with tax filing requirements. It waives replacement fees for critical documents and asks state agencies to give extensions for filings and audits and relief from penalties to those affected by the quake. Anticipating that many workers are, or will be, unemployed as a result of the earthquake and are in need of immediate financial assistance, the executive order suspends the one-week waiting period for quake-affected unemployment insurance applicants through October 2. The executive order suspends statutory and regulatory requirements for owners of damaged mobile homes that require additional inspections by the state. In addition, Governor Schwarzenegger said he is preparing a request for financial help from the federal government once joint state and federal damage assessment teams have completed their reports. The governor has also committed California to assist the Mexican government in their relief efforts. “In Mexico, there have been two deaths and more than 100 injuries. My administration has reached out to Mexican officials to offer as much help as we can,” said the governor. Truckloads of cots, blankets, pillows, personal hygiene kits and generators were provided to Mexican officials after they requested help for those still displaced from their damaged homes. The California Emergency Management Agency has prepositioned disaster relief supplies throughout California ready for distribution. Most of the supplies sent to Mexico came from a larger cache at the agency’s Southern Region Emergency Operations Center in Los Alamitos and some items from a warehouse in Fresno. On Wednesday evening, 2,975 standard cots, 600 heavy duty cots, 6,940 blankets, 3,384 pillows, 4,472 personal hygiene kits and 44 portable generators were transported to the Imperial County Fairgrounds by the California Department of Transportation and the California Conservation Corps. Mexican emergency officials have picked up these supplies for transport to Mexicali.